. Machinery Blog – Page 2 – Buy and Sell Machine Tools online. 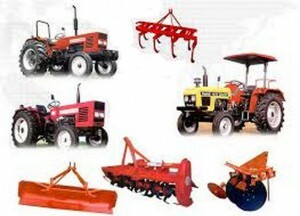 Used machinery for Sale Directory. When it comes to making a final decision and determining how useful a discovery is, we must inspect the equipment before purchasing it. This is no different when searching for a functional hydraulic press. Without question, in order to maintain a high level of hydraulic press productivity, it’s essential to follow a detailed preventative-maintenance (PM) program that has already been created by the machine’s manufacturer. Of course, the first step in the process is to find out if the current owner has taken proper care of the machine. You will want to check the cleanliness of the equipment while also inspecting the general appearance of the hydraulic press. In some cases, you will be able to determine whether the press is a good find just by how it looks. But, don’t rely on exterior appearances alone. The second step of the inspection process is to understand how a hydraulic press works and the parts that make it operate. By fully understanding the machine’s operational capabilities, anyone searching for a hydraulic press will be able to determine if the machine is in good condition or not. This is not only true for this specific piece of equipment, but for other machines too. 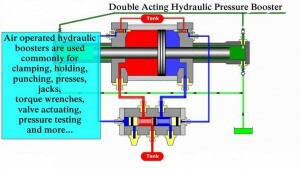 Quite possibly the most important component of a hydraulic press is the feed actuators. The physical condition of the feed actuators will be able to determine the exact position of the machine tool and make sure that it adjusts to the proper position in relation to the punch above it. By ensuring that the feed actuators are functioning effectively, you will be able to determine if the component will stay in place until the metalwork has been completed. Another extremely important operational part of the hydraulic press is its pressure intensifier. In order for the machine to work properly, this component will be completely powered by an air pressurizer that manages the manifold pressure that is controlled by specific valve outputs. Without a proper functioning pressure intensifier, a hydraulic press is virtually useless. The controller is a specific computer program that allows the press operator to input certain commands. Whether you need to perform an individual task or a variety of them, the controller is the main part that will allow this to happen. If you need to inspect used equipment that is being sold online, it can be extremely hard to find the results that you require. In order to receive the proper inspection on a potential hydraulic press online, you will need to use all of the resources available to you. A good idea would be to ask the seller for a live video of the machine in operation or to take advantage of live video chat software. If you love working with wood, you can certainly turn this hobby into a satisfying and lucrative career. The main function of any woodworker is to create and repair crafts made from lumber. Carpenters will be required to use hand and power tools to build, remodel and repair anything made from wood. In addition, the mind of a professional carpenter is always thinking of inventive ways to make a working environment more efficient. They may be called upon to build scaffolding or sturdy platforms, to aid other areas of construction to run smoothly. Cabinet makers are always in high demand, especially for their custom work. Kitchen cabinets, closets and office furniture are just a few of the types of projects that a cabinet maker can expect to be engaged in. In addition, they may be responsible for planning (creating a blueprint), constructing, installing and repairing cabinets. Installing hinges, draw pulls and latches, also fall under a cabinet makers job description. Finishers are the people that smooth, fill, treat and finish the piece (usually furniture) before it leaves the shop. Finishers not only work with new pieces, but also with antiques. A quality finisher will usually take a piece apart for thorough inspection, evaluation, and conduct any repairs (including bleaching, stripping and sanding the wood, as necessary). Other careers that revolve around wood include (but certainly not limited to): loggers, lumberjacks, wood carvers, home and/or boat builders or a Luthier (someone who builds original musical instruments). In addition to the above mentioned careers, teaching is also a great way to earn a solid income and share your love of woodworking with a new generation. To start your own business, it is advised to first create a unique website, and then follow up with other marketing techniques such as: trade shows, flea markets and newspaper ads. If you are honest and continue to produce quality work, your business will naturally grow. It is important to not take on more than you can handle, and always be honest with your customers. For instance, if you estimate that an order will take two weeks to complete, clearly communicate this timeline with your potential customer. In addition, when scheduling time to complete a project (paid order) don’t forget to factor in potential set-backs, and schedule much needed family time. 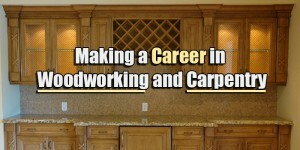 Yes, you can make a living by turning your love of woodworking into a viable career. The secret is to focus on your strengths and your greatest passion. For instance, if you prefer spending time carving, then that is the area you should dedicate your time and focus. 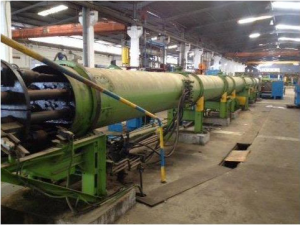 Machinery International Corporation (USA) has been selected to sell the plant and machinery of the Profil Desnoyer Copper Tube Plant in Tunis, Tunisia. This will be the 15th copper tube plant to be liquidated by Machinery International in the last 30 Years. Profil Desnoyer is a full service copper tube manufacturer producing both water tube for the plumbing industry and air conditioning and refrigeration (ACR) tubing. The machines will be sold on an individual basis and include an extrusion press, drawbenches, vertical spinner blocks, horizontal drawblocks, six Schumag combined draw, straighten and cutoff machines, annealing furnaces and pointers. The Finishing Department includes an automatic tube bundler, shot blaster and truck scale. In addition the sale will include a complete Copper Tube Fittings Department for the manufacture of copper tees and elbows. There are also approximately 6000 carbide dies and plugs to be sold ranging from 4mm to 50mm. Regardless of whether you’re trying to sell your used farm equipment for a new machine or simply trying to unload your old equipment for good, trying to find a buyer can be a very long and drawn out process. Luckily, because of a farm machinery’s life expectancy, many farmers are continually trying to find the best deal on specific pieces of new and used farm equipment. With many traditional and new-age selling options available, ranging from word of mouth, online sales and newspaper classifieds, selling your old farm equipment might not be as difficult as you originally thought. As long as you find the right outlet for your needs and invest the necessary amount of time, you will definitely be able to find a buyer for any piece of used farm equipment. In today’s world of technology, one of the best outlets for you to us when it comes to selling your used farm equipment is the internet. By using specialized online classifieds, you will be able to reach a wider range of prospective buyers while also having a broader location reach. For example, certain online agricultural or machine sale marketplaces will be able to reach more potential buyers than a local newspaper classified advertisement. In order to find the best outlet to sell your used farm equipment you should research different websites that specialize in this type of machine sale. While posting a classified ad in a local newspaper doesn’t have the same reach as trying to sell used farm equipment online, this resource still has a few distinct advantages. This is especially true if you live in an agricultural community. By using a local newspaper in a farming city or town, there are typically more people that will be searching for a specific type of farm equipment. In addition to posting a classified ad in one particular newspaper, you can also place for sale ads in a variety of different papers in the surrounding areas. This will allow you to reach more people that might be interested in purchasing used farm equipment. When it comes to selling used farm equipment, word of mouth is a very effective method. Because the farming industry is relatively specialized, farmers are known to trade supplies, tools and recommend different pieces of equipment that are currently for sale. This also includes asking around to see if certain pieces of machinery is being sold by anyone in the area. Often times, if you know the right person in a farming community, you will usually be able to find someone that needs a certain type of equipment. 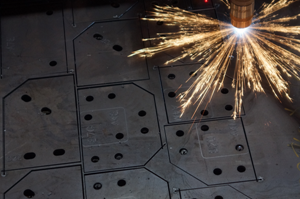 2015 will bring change to a variety of industries, and metal fabrication is no exception. With the proliferation of 3D printing technology and the improved economy, it’s very likely that metal fabrication will see both renewal and change in the upcoming years. A continually improving domestic economy is bolstering a need for metal fabrication, especially where jobs that were once outsourced are coming back domestically. According to WeldingSchool.com, the energy and construction industries are growing aggressively, by as much as 12% and 20% in 2014, respectively. Through 2015, it’s likely that economic improvements will continue supporting the metal fabrication industry—and the manufacturing industry as a whole—and that there will be a need for both experienced and knowledgeable technicians. In markets where the growth outpaces supply, metal fabrication technicians will find that salary rates will likely increase. As much of this is driven by the oil and gas industry, some of the increases may be localized to areas that have a large oil and gas presence. Though 3D printing is still at least a few years off from becoming a standard in consumer markets, commercial 3D printers have become quite robust; two thirds of industrial manufacturers now use the technology, according to Computer World. 3D technology will allow the metal fabrication industry to create more detailed parts on demand, and to fabricate parts on-the-fly as needed. For the industry, this also means that metal fabrication will be interlaced with understanding of 3D programs, and a need for further education may be necessary. Rapid prototyping may become a part of the design mechanics for many companies, leading to a need for fast, agile manufacturing through the use of commercial 3D printers. This may also develop a need for more specialized workers, who can work with a variety of fabrication needs and who are knowledgeable about the software and systems in use. Boot camps for metal fabrication are already emerging in areas that are� considered hotbeds for the metal fabrication industry, as reported in the FDL Reporter. Throughout 2015, metal fabrication boot camps will likely become popular as a way to jump-start a career quickly in areas that have significant demand. Metal fabrication boot camps cover a wide variety of equipment and techniques, with the goal of educating technicians so they can immediately begin working within their field. These boot camps are valuable not only to new students, but also professionals who may not be aware of the newest metal fabrication techniques. As metal fabrication is an industry that is quickly changing, older techniques are becoming outdated very quickly. The future of the metal fabrication industry will likely be even more tech-heavy than ever before, requiring technicians who are highly trained in both computerized technology and the basics of fabrication itself. Demand will also likely increase, creating a void that new graduates can fill. To compensate, new programs will be developed to help those interested in metal fabrication get a head start towards employment. Overall, the future looks extremely promising for those within metal fabrication, and it’s likely that this trend will continue for some time. 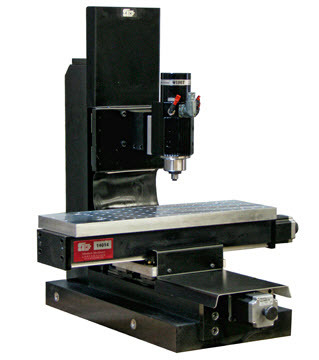 A milling machine is used when a detailed design is required to be cut into a certain type of material. A special rotating tool is used and it moves back and forth, cutting thick layers into the material with each pass. A CNC (computer numerically controlled) milling machine has the ability to cut 3D objects. FRAME. The material the frame is built from will determine the overall strength of the unit. Aluminum is commonly used in the construction of mini mill frames. SPINDLE. The spindle for large CNC mills for sale are usually pre-determined, but for a CNC mini mill, you need to consider the motor size, and the minimum/maximum speed, as this will determine how fast the spindle will spin. Regarding the spindle, accuracy is always more important than speed. WORKHOLD. The “workhold” is what is going to hold the material securely to the CNC mini mill machine table during the cutting process to ensure accuracy. To save on costs, you can use clamps that you currently have in your workshop. Although, it is recommended to invest in a quality vise that has a deep and wide jaw. To avoid the material shifting ever so slightly, and not achieving the end result you intended. The CONTROLLER connects to the computer. The control panel is considered to be the heart of the machine. Check for software compatibility, or look for a computer that is pre-configured. A pre-configuration may be a more costly option, but may be worth it, when compared to time (and possible frustration) invested by non-computer savvy operators. Choosing the right SOFTWARE package is going to weigh heavily on the types of projects you plan to create. Choose a software package that has a “tool-path” feature, as this will not only provide you with the time it will take to complete the job – but it also provides you with a visual virtual walk-through of the milling process before the actual cut is made. for your benchtop mill or CNC mini mill machine is very important. This is an area that you must dedicate a lot of research. You want to choose the best software to meet the needs of the project. Also, you want to look for software that will not become outdated, before you take it out of the box. Before purchasing CNC milling machine software, ask about the cost and availability of upgrades. Vertical CNC mills are highly recommended for vertical drilling work. A Horizontal CNC mill machine has the cutter running horizontally along the table. A Box Mill is perfect for a hobbyist/non-professional operator. The C-Frame Mill is the type of machine found in large factories, and industries that need to produce high quality product at a fast rate. 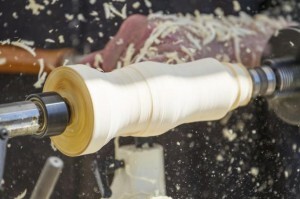 There is also the Knee Mill, which is known for its X-Y table feature. Coolant Tube. During the metal milling process, the machine and the material both become very hot. Coolant is pumped though tubes, to not only keep material cool, but also to lubricate the machine/tool to ensure a smooth cut. The Table is the flat surface that supports the material. The wood, metal or plastic piece is clamped to the table. Axis. 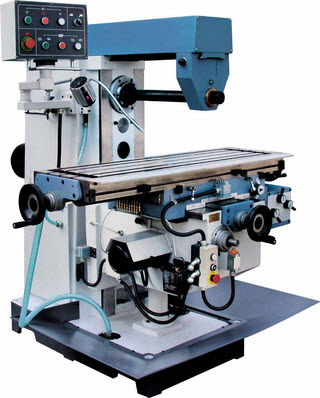 CNC milling machines can have 1 to 6 axis. The Column runs parallel to the axis and holds the milling part in place. The Cutting Tool is attached to the column, and this obviously is the instrument that actually does the cutting. Following correct safety protocols when excavating is critical. According to a report by Osha, two workers are killed every month due to trench collapse. Keeping the crew safe should be a priority, but often safety protocols are overlooked or ignored for convenience or deadline completion. In this article we will take a look at the top 5 excavating safety tips. 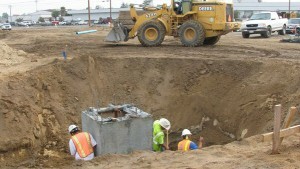 Shoring: Installation of supports (typically hydraulics) to brace soil and prevent collapse. Benching: Installation of steps providing safe access and exits for the trench areas. Shielding: Installation of steel or aluminum protective structures around workers in the trench. Sloping: The process of digging the trench wall at an angle, sloping away from the excavation. Each cubic yard of soil can weigh as much as a 3,000 pound car. Depending on the type of soil the crew is working with, workers may have to slope, bench or shore the trench. Soil classification should be performed by a knowledgeable, competent worker. Failing to properly follow these guidelines can result in a tragic cave-in. Heavy equipment should be distanced from the sides of the trench, as far away as possible. Removed soil and other materials should be kept a minimum of two feet away from the edge – more if possible. If the terrain does not allow for two feet of clearance, soil should be moved to another location. 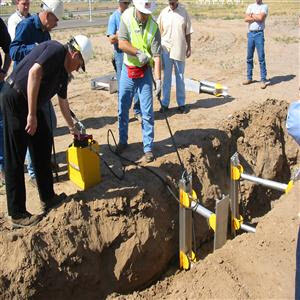 Follow proper testing protocols: Once a trench has reached the four-foot mark, atmospheric testing should be performed. Trenches that show any signs of harmful gases, low oxygen levels or hazardous fumes should not be entered until properly dealt with. Provide safe access to and from trenches: If trenches are more than four feet deep, additional requirements apply. Safe entrances and exits should include the implementation of ladders, ramps or steps. Ladders must extend above the trench surface a minimum of three feet. Failure to adhere to safety guidelines may result in trench collapse. The loss of life is simply not worth bypassing regulations in an attempt to beat a deadline. Employers should educate workers on excavating regulations, dangers and security measures, and reminders should be given in the form of memos, brochures and posted signs. Trench collapse can be prevented by proper training and implementation of security protocol. Lifting heavy objects is a fundamental part of human life. Some humans can lift more than others while a few train to lift incredible loads. Eventually, the weight that needs lifting – or the demands of doing so repetitively – exceeds the abilities of one man (or even a group of men). That’s where mechanical advantage comes into play; more specifically, the machine. Machines can be as simple as a long stick (lever) and a rock (fulcrum) or as complicated as a modern-day airplane. But, for lifting heavy loads, nothing beats to power of a crane. Cranes for industrial and public use come in basically two forms: installed and mobile. 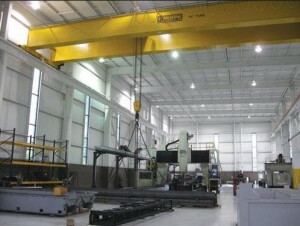 Installed cranes (sometimes called bridge cranes) are ideal for interior commercial applications. We’ll discuss them in a future article. This article is going to focus on the mobile crane. We’re all familiar with the basic construction crane – a truck or track-mounted boom with a retractable cable and pulley – and even at a young age, most kids can identify one on sight. These cranes are ideal for unloading and loading, construction, and generally moving heavy things around. They have the added benefit of being able to move from place to place – whether on their own or via trailer – without (much) assembly and dis-assembly. 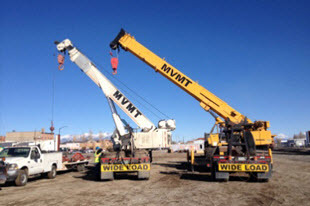 If your needs gravitate towards these unique tools and you’re in the market for a mobile crane, you might consider purchasing a used crane over a new one. 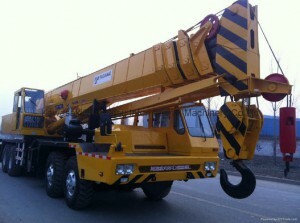 Websites such as MachineSales.com are great resources for used cranes for sale. 1) How much weight do you need to be able to lift on a regular basis? This is a pretty obvious consideration and doesn’t need much explanation. 2) To what height do you need to lift the weight? If you’re just moving weight from a truck bed to ground level or vice versa, you could get away with a simple truck-mounted crane. If your needs call for lifting weights to multiple stories or more, you might need a crane with a large boom. 3) Where do you need this crane to go? If you’ll do most of your work on relatively hard surfaces, the aforementioned truck-mounted crane would suffice. However, if you’re venturing onto softer surfaces – such as those often found at construction sites – a track-mounted crane that can traverse variable surfaces would be more useful. 4) How does is this crane transported? Truck-mounted cranes can easily be transported from site to site at highway speeds while larger, track-mounted cranes – which have only one or two forward gears – require a separate truck and trailer for transporting in a reasonable amount of time. 5) Is special training required to operate the type of crane you need? Some cranes require little to no training while others demand extensive training. A crane can be a valuable addition to any equipment lineup and leave you wondering why you didn’t get one sooner. If you have questions about which type of crane might be right for you, feel free to contact MachineSales.com and we’ll be happy to help. If you’d like to see what’s available in used cranes for sale, navigate to our home page and search for cranes. Author Machine SalesPosted on March 11, 2015 March 17, 2015 Categories Lifting and Material Handling EquipmentLeave a comment on Lift That Heavy Object! 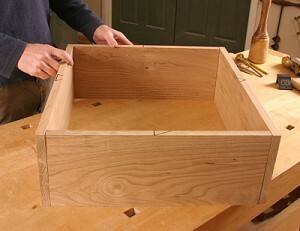 When examining cabinets, frames and other wood furniture that would require interlocking joints, you may see dovetails. Dovetailing is one way to secure two pieces of wood together (without the use of nails), while at the same time adding a creative touch to your projects. Dovetailing means that corner joints fit together like a jigsaw puzzle that provides tensile strength. 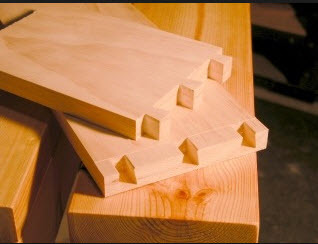 You can create a dovetail joint by cutting a series of pins that will interlock with a series of tails, extending from one end on one board into the end of the other board that you wish to connect. Dovetailing is a tell-tail sign of the age of a piece of furniture. The older the piece of furniture, the wider spaced and larger the dovetails are. Basically, the older and cruder the woodworking tools were, the older the furniture is. A dovetail joint creation is made easier by a dovetail machine. These joints, which are shaped like the rear feathers of a dove, secure two 90-degree wood angles together. It is both wonderful and sad that the advancement in the woodworking industry allows for more accurate precision, and wood furniture can be made more quickly. In recent years, many furniture companies are mass producing furniture, and to save money and labor, many parts are interchangeable (hence they need to be identical). For this reason alone, dovetails are no longer a common practice in making furniture. Craftsmen use half blind dovetails when they want to hide the end grain from being seen from the front of the project. This type of tail is commonly used to connect the sides of drawers to the front of the drawers. These are also known as, “false fronts”, to cabinets. 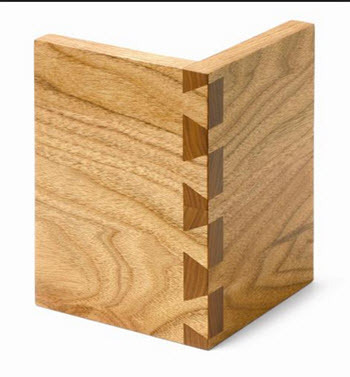 These are also commonly referred to as “mitered blind dovetails”, and they are used in high quality cabinetry, adding strength to the project, yet are totally hidden from sight. Sliding dovetail joints are one of the most versatile of the dovetails. This is used when you are looking to add shelving to a bookcase or some other type wooden structure requiring the interlocking strength of the dovetail. Two boards are joined together at right angles at the intersection of one of the boards that is not the end. These sliding dovetails are built simply by sliding the tail into the socket that is usually tapered to make the rear of the joint tighter. However, the joints slide easily together. When completed, this tighter joint will add more strength to the finished product. This are also known as “French dovetailed” when used in the construction of drawers to provide strength. The dovetail is now considered the sign of a craftsman, no matter the type, whereas in the past, a dovetail would have been covered in veneer. With a new piece of furniture, a dovetail is a sign of quality, and that a craftsman put the time into creating it, with an older piece it can be used to guess age. 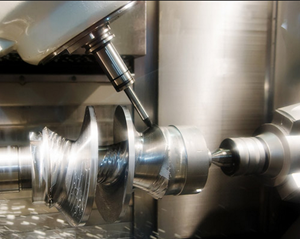 The manufacturing sector relies heavily on CNC machining as a part of their automated production lines. CNC machining is a computer- controlled process used to control machine tools. CNC machining is a more sophisticated version of computer control because it utilizes unique software in combination with a console control panel to control a variety of machines including lathes, mills, routers, drills and grinders. Machine tools work by numerical control under CNC machining. A customized software program is created for each object that will be manufactured. 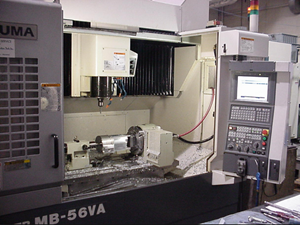 The machines are then programmed using CNC machining language or G –code. This code controls many different aspects of the work to be done including the material feed rate, positioning and speed or velocity. CNC machining is utilized on both metals and plastics in the manufacturing sector. The first step in CNC machining is to create a 2D or 3D CAD drawing of the object including its shape and all measurements. Next, a programmer creates the machining code. An operator loads the program and runs a test to make certain there are no problems with the code. The program is run without material. This step is referred to as “cutting air” and it is a crucial step in the process to ensure the tool position and speed are absolutely correct. Any mistake can result in damage to the machine, or to the part. CNC machining has several benefits over manual machining. The process is much more precise than manual machining, and once the program is loaded and tested it can repeat the process precisely over and over again, resulting in perfectly manufactured parts that can meet very small tolerances. The resulting parts are identical to one another. This process also produces objects much more quickly than manual machining and allows manufacturers to meet high volume orders with ease. Another benefit of CNC machining is that it can produce complex shapes and three-dimensional shapes that are almost impossible to create using manual machining. Unlike humans that require mandated rest periods throughout the work day, CNC machines can run 24 hours a day, 365 days a year. The only time they need to be turned off is for periodic maintenance, or repair. The other benefit to using CNC machines is that the engineers or operators of the CNC machines do need as high of a skill level as manual machine engineers and one operator can supervise several machines simultaneously, saving on labor costs. Repetitive tasks are easily automated and with the precision of CNC machining there is very little waste and significant increases to overall productivity that enables manufacturers to keep their costs low. A water jet cutter can slice metal or other materials by utilizing a high velocity water jet and pressure, or a mixture of high velocity water and an abrasive substance like sand. This process is commonly used to produce machinery parts that use materials which are sensitive to high temperatures. Water jet cutters can cut, shape, carve, or ream materials. The CNC plasma cutter utilizes a plasma torch. It is most often used to cut steel, but it can also be used on a variety of other materials. The plasma cutting process uses an inert gas like compressed air which is blown out of the nozzle at a very high speed. Simultaneously, an electrical arc is generated through the gas from the nozzle to the surface of the work piece. Some of the gas turns into plasma. The plasma is hot enough to melt the material being cut and moves fast enough to blow the melted metal away from the cut. Lathes cut spinning pieces of metal. CNC lathes can use indexed tools and drills to make fast, precise cuts. The lathes use complicated programs in order to manufacture parts that cannot be produced with a manually controlled lathe. Many lathes use G code or read a manufacturer’s proprietary programming language. 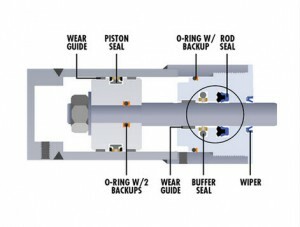 CNC lathes often contain up to 12 tool holders and coolant pumps in order to reduce wear and tear on the tools. CNC mills work by translating programs that consist of letters and numbers to move the spindle to different depths and locations on the work piece to cut a variety of different materials. This process is often referred to as spark machining. Electric discharges are used to create a desired shape. Material gets removed from a work piece by a series of quickly recurring electric discharges occurring between two electrodes. The electrodes are separated by a dielectric fluid and the discharge is subjected to an electric voltage. One electrode is the “tool” electrode and the other is the “work piece” Electrode. The electric field in the space between the electrodes grows stronger than the strength of the dielectric when the distance between the two electrodes is reduced. This results in the dielectric breaking and allowing current to flow between the electrodes. When the current flows between the electrodes, material is removed from both of the electrodes. When the current stops, new dielectric fluid is added into the inter-electrode volume which lets the solid particles be carried away while the insulating properties of the dielectric are restored. This process is referred to as “flushing”. The manufacturing industry covers many different applications. Manufacturing can be a highly automated process. The machinery most commonly used in modern production lines and manufacturing companies are CNC machining tools because they can deliver exact copies of an object faster and more accurately than manually controlled machines. They can also reproduce complicated shapes and forms that cannot be created with manual machining. Their speed and accuracy also reduce labor costs and waste while increasing productivity and efficiency. These things allow manufacturers to keep costs down and meet high volume demands.